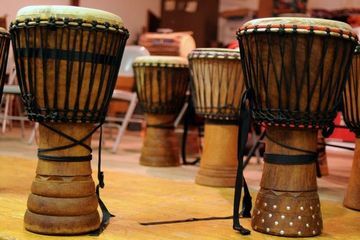 • be a part of playfulness and camaraderie This is a facilitated drum circle in a safe, and structured format. Meetings will be take place at Simsbury Therapeutic Massage & Wellness in the Town Centre Shops on Hopmeadow Street, and meet-ups will be confirmed once 4 "Yes" RSVP's are in. In cold weather, our max is 10-12, only because of indoor space limitations. When weather is warm, we can have more participants, and meet outdoors. Bringing one's own drum is welcome, and encouraged, but drums are made available for those without their own by the meet-up's facilitator. This drum circle is exclusive to rhythm instruments.